There is never a dull moment in the Chilebrown kitchen; literally. A sharp knife makes cooking preparation easy and safe. 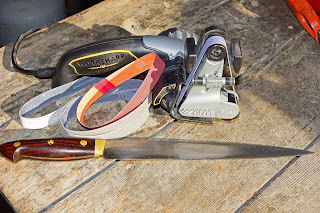 Over the years I have had numerous sharpening systems. Most of them take a certain amount of skill and patience to properly sharpen my knives. I have found and purchased a new sharpening device called the ‘Work Sharp Ken Onion Edition Knife Sharpener. That is a mouthful of a title. Ken Sharp is a legendary hall of fame knife maker and has designed this tool for the Work Sharp Company. It will easily sharpen any and all of your knives. It even has a scissor sharpening function. Let’s sharpen some knives. This tool comes with multiple sharpening belts with varying grits. Depending how dull your knife is will determine the appropriate belt. The belt slips easily on and off of the machine. 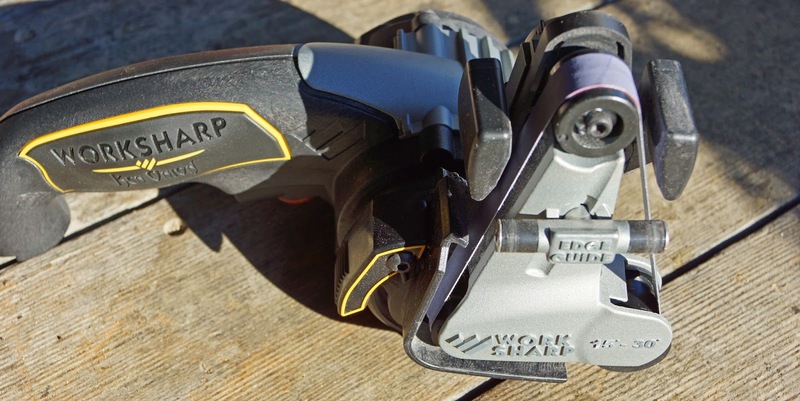 Once your belt is loaded you need to set the angle to sharpen. Most kitchen knives are ground to twenty degrees. There is a simple trigger switch that controls the speed of the motor which turns the sharpening belt. You draw the knife through the machine through the appropriate slot. This slots guide your blade at the correct angle. A couple draws for each side of the knife will do. You then change the belt to a finer grit and repeat. This system could not be any easier to use. I have been sharpening my favorite knives to razor sharpness. My new sharpener is a welcome addition to the Chilebrown arsenal of cooking tools. This tool actually is fun to use. Now that my knives are sharp it is a simple task to use a hone to keep them sharp. We will see you next time I am off to sharpen some scissors. Looks like a good system. Big Dude, I may even sharpen the lawnmower blades. Nothing is dull around here. I have a much simpler sharpener but, like you, I just LOVE a good sharp knife. Zoomie, I am glad you have a simpler sharpener. Sharp knives are safer. Now I can order new wrenches by just one click! And Inside Tool is miraculously fast in the response of the requests! Great platform for all the residents nearby! The device is well known for the included vibration panel and the servo-pushed cup filling gadget. The device is also widely recognized for the accuracy on the subject of the packaging of products into bags with an excessive-efficiency stage when it comes to the load of the programs https://cmmshow.com/best-tool-for-stuctural-designing-artioscad/.